This article is about the city. For the kingdom, see Sentinel (kingdom). Her domes agleam in the Iliac dawn. Their way between man's walls of stone. They quickly discovered and established control over the locals' port with little if any opposition. Yaghoub conscripted the locals to serve as masons and servants in the building of his new palace, Samaruik, and the rest of the city. Samaruik, also called Sentinel Palace, remains the oldest and largest architectural achievement in the city, and several additions have been built onto it over the years. After Sentinel was attacked by Abecean pirates, Yaghoub built the Impervious Vault - a fortified storehouse under the city, most notable for housing the Ansei Wards. 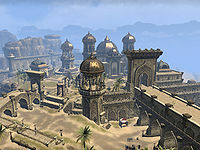 When the Crowns followed the Forebears into Hammerfell, they considered Sentinel a "worthy seat", and many of the Na-Totambu settled there (but the city has always been considered a Forebear stronghold, though that term wouldn't be in use until the days of the Second Empire). Sentinel and the surrounding area have long been notorious for widespread, underground necromancy. In 2E 582, under the reign of the Forebear King Fahara'jad, Sentinel came under the threat of attack from an undead army. The army was vanquished, though, in what the Forebear king asserted was a divine intervention. During the Interregnum, control of Hammerfell reverted to the hereditary monarchy of the Na-Totambu. To the chagrin of the Forebears, the new High King boldly moved his throne from the old capital Hegathe to the more prosperous Sentinel. By this time, Sentinel had mastered a third of the trade in the entire Iliac Bay. Upon the death of High King Thassad II in 2E 862, the Forebears retook their city by force. 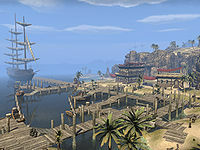 The vengeful Crown Prince A'tor set sail to the city to avenge his father, resulting in one of the bloodiest massacres in Tamrielic history. When Tiber Septim swept in and reestablished Cyrodilic control over the province, it was seen as a humanitarian intervention. Despite the defeat during the War of Betony circa 3E 402, the city of Sentinel continued to flourish, and it was renowned at the time as the place to go to earn some quick gold or find a bit of adventure. Hammerfell was controlled from the city's throne. An unsuccessful assassination attempt on the life of Queen Akorithi was widely attributed to jealous Daggerfall royalty, though this was never proven. Sentinel is home to a School of Julianos. The Osseous Crux was brought to the Mages Guild in Sentinel for study, though it vanished within three weeks. ^ Cyrus' dialogue with N'Gasta in Redguard. 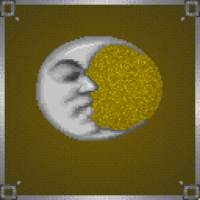 ^ Rumors heard during the tutorial in Daggerfall. ^ Mynisera's dialogue in Daggerfall.